The weight capacity of hammock stands is something that varies a fair amount. While many hammock stands often look incredibly sturdy, the recommended weight capacity can occasionally prove otherwise. One thing that may come as a surprise to you, is that wooden hammock stands are generally able to hold less weight than steel hammock stands. Despite the fact that wooden hammock stands often look way more durable due to their thicker design. To start lets take a look at the average weight capacities of each type of hammock stand. 9 ft long space saving hammock stand (Horizontal) – The space saving steel hammock stands are usually between 9 and 10 ft in length. Generally you can expect to weight capacity to be in the region of 300 lbs up to 450 lbs. You may occasionally find some that are a little under 300 lbs, however since the prices for these 9 ft long hammock stands are fairly competitive (under $100) it probably makes sense to choose one with a 400 or 450 lb weight capacity. Take a look further down the page to check out some of the best options that have 450 lbs weight capacities. 12 – 15 ft Hammock stands (Horizontal) – If a horizontal steel hammock stand isn’t classed as space saving (9 or 10 ft long) it will usually be either 12 or 15 ft in length. However, 15 ft long stands are more common. Most stands in this range will be able to hold around 350 – 600 lbs in weight. Generally the 15 ft hammock stands from more reputable brands can hold up to 600 lbs making them very sturdy choices. You can view some of the best hammock stands with a 600 lbs weight capacity below in the next section. Wooden hammock stands (Horizontal) – As mentioned earlier wooden hammock stands are capable of holding less weight than their steel equivalents. Wooden hammock stands generally measure between 12 to 15 ft in length. However their weight capacities usually fall within the 275 – 450 lbs range. Below in the next section you will find a couple of wooden hammock stands that have the highest weight capacity of 450 lbs. Hammock chair stands (Steel) – Upright hammock stands or C-stands vary a little with regards what weights they can safely hold. On average most hammock chair stands can hold around 300 lbs. The weight capacity range for most hammock chair stands is usually between 225 – 350 lbs. Upright hammock chair stands are generally designed for single person use. Whereas many of the horizontal stands are for use with double hammocks and therefore have a weight capacity more suited towards 2 people. You can see some of the 350 lbs weight capacity hammock chair stands below in the next section. You will also see a Hugglepod stand included that’s able to hold up to 600 lbs in weight, which could be a good option to use with a hanging hammock chair should you require the extra weight capacity. When it comes to choosing a 9 ft long steel hammock stand, one of the best rated and most popular is the Vivere 9 ft stand. This well rated stand can also be bought along with a double hammock in a combo set (pictured) and is able to hold 450 lbs in weight. You can find more information about the Vivere stand on its own here, or take a look at the Vivere 9 ft hammock stand combo sets here on our Vivere page to view the double hammock color options available. One last thing to point out with the Vivere 9 ft stand, is it is sometimes cheaper to buy the stand with the hammock included in a combo set. As strange as it sounds the price of the stand is sometimes higher than if you were to purchase the complete set so be sure to check both prices! The highly rated Caribbean Hammocks Tri Beam 15 foot hammock stand is one of the most sturdy hammock stands in this length range with a 600 lbs capacity. Like many of the hammock products from the brand Caribbean Hammocks the heavy duty 15 ft hammock stand is very well rated. It is also very competitively priced when compared to other 15 ft hammock stands that also have a 600 lb weight capacity. You can also purchase the Caribbean Hammocks 15 ft tri beam hammock stand in a combo set. Which includes a jumbo Caribbean hammock (pictured right), you can view the wide range of hammock color options available with the stand here on Amazon. The hammock stand is available in a mocha or black finish which can be chosen on visiting the retailer via the product page here. The other notable 15 ft hammock stand that has a 600 lbs weight capacity is the Hatteras 15 ft Tri-Beam Steel Hammock Stand. However there is not much difference between the Caribbean Hammocks stand and the Hatteras model aside from the Hatteras model costs more. The Hatteras hammock stand is also not available in a combo pack. When looking for a very heavy duty wooden hammock stand there are very few options to choose from that hold in excess of 400 lbs. However, one of the most sturdy and durable wooden hammock stands that holds 450 lbs, is very well rated. The Petra Leisure 14 ft wooden arc hammock stand is certainly one of the best around for durability. It is also available with a spreader bar double hammock included. Compared to other wooden hammock stands the Petra stand is very well priced. Also since many wooden hammock stands often have pretty mixed buyer reviews and ratings, it is refreshing to see that the Petra Leisure wooden hammock stands widely receive consistently high ratings. You can view the Petra 15 ft wooden arc hammock stand here or take a look at the Petra stand with the hammock included here! 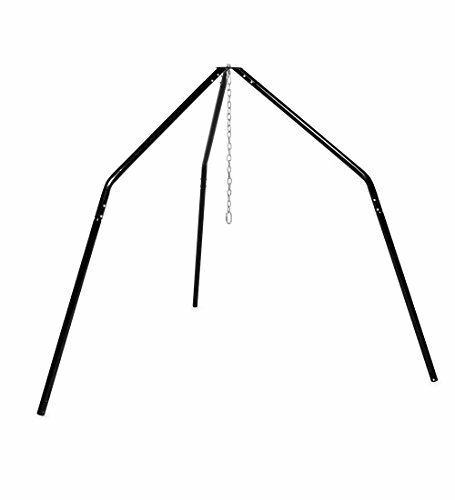 There are a number of hammock c-stands that are able to hold in excess of 300 lbs as you can see on our category page here. However there are only a small amount that are able to hold up to 350 lbs in weight. The first is the Zupapa C frame hammock stand (pictured right) which for many is a very good choice, especially if you are looking for a durable hanging chair stand. The Zupapa chair stand is ideal for indoor or outdoor use and has a fairly compact space saving design. Standing at 84″ in height the Zupapa hammock chair stand is a great choice for a range of chairs. Another option is the Hatteras Hammocks steel swing stand which also can hold up to 350 lbs. The 8 foot tall Hatteras swing hammock stand has a very unique and good looking design, making it a very stylish option to consider. The sturdy circular base is also a very good feature to ensure complete stability. As mentioned in the previous section there is also a HugglePod hanging stand available that can hold up to 600 lbs in weight. If you are after a really strong upright hammock stand, the HugglePod stand (pictured right) is ideal for hanging a hammock chair from. One downside to this however is, you will need to find a hanging chair or hanging hammock that also has a very large weight capacity. Otherwise getting a hammock chair stand this strong may be a waste of time. Overall though the HugglePod stand is a good choice if you need something very sturdy and durable to hang your chair from! Searching through a bunch of hammock stands to find the strongest is often quite a time consuming task. In addition to this once you find a strong stand you then need to find an equally strong hammock to hang off the stand! Luckily in the list above there are plenty of options that come with a hammock included with the stand. This, in our opinion makes life a little easier if you are concerned about the overall strength and durability of either the hammock or stand. As a hammock stand with a large weight capacity is going to be fairly redundant if the hammock you hang from it is much weaker.